One strange thing about Europe in general: sales tax, which is very high by US standards (in the 15% range), is included in all prices. This is a fantastic idea from a practical standpoint, although I can’t quite square it with the informed-citizen, government-oversight thing. Bottle deposits, though, which are also high (10-20 cents), are not. In the Czech Republic, and now Slovakia, the result is that the price of beer can be as much as 50% more than what’s on the sticker. If you’re doing the math and wondering if I made a mistake, don’t; a pint bottle of cheap beer is indeed about 30 cents. Obviously, I’m just back from the grocery store, having laid in provisions for tomorrow’s hike: bananas; potato chips; pears; Snickers; and 2 L of Coca-Cola. The hypothesis being that an abundance of caffeine and simple sugars can’t be a bad thing when you’re engaged in what I’m conservatively estimating will be 12 hours of exercise. 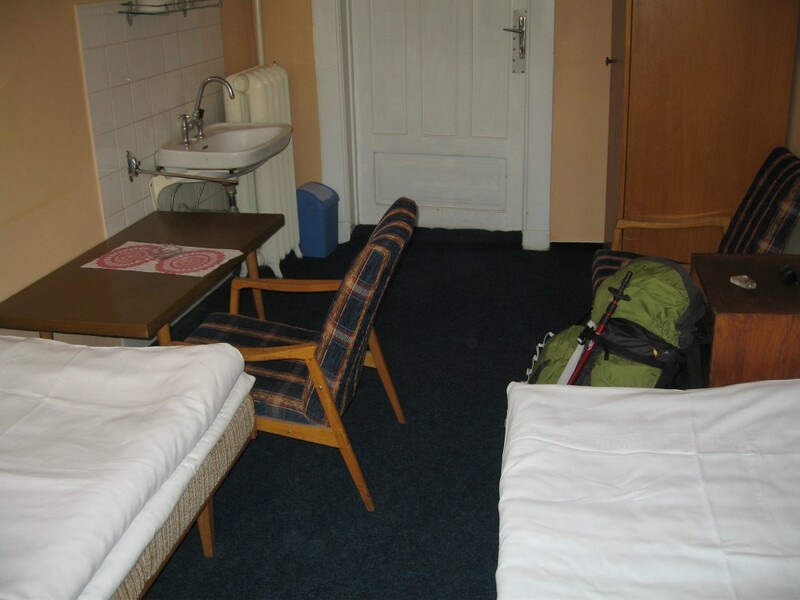 Tonight I’m staying in this hot-sheets hotel in Poprad. The only things it has going for it are that a room is $20, and it’s directly across the street from the train station. Handy for when you have a 6:18 AM train.